It will be a classic case of 'friends turning into foes' when Mahendra Singh Dhoni's Chennai Super Kings (CSK) will clash with Gautam Gambhir led Kolkata Knight Riders (KKR) in the opening match of the IPL tomorrow, less than a week after the duo guided India to their historic World Cup triumph in Mumbai. Virender Sehwag said his kind of explosive batting was very difficult to emulate and he would not be able to explain his batting techniques to anyone. Nathan Rimmington, a 28-year-old all-rounder from Queensland, will be making his Indian Premier League debut in this edition. Kings XI Punjab had bid for Rimmington in the auction at Bangalore for a relatively modest price of US$ 20,000 and surely they know a thing or two about this player nicknamed Rimmo. Star batsman Yuvraj Singh, who played a key role in India's World Cup win, said leading new IPL entrants Pune Warriors is big responsibility but he is excited to take up the challenge. With the fourth edition of the Indian Premier League all set to kick off from tomorrow, Kings XI Punjab are back to try their luck at winning, or at least fighting to win the coveted T20 league. A composed Wayne Rooney netted a potentially priceless goal as Manchester United earned a 1-0 Champions League quarter-final, first leg victory at Chelsea, while Barcelona thumped Shakhtar Donetsk 5-1 in Spain. Cricket South Africa (CSA) has started its process of selecting a new coach for the national team to replace Corrie van Zyl and is pleased with the quality of candidates who have applied for the job from within the country and outside. Sania Mirza and her partner Elena Vesnina pulled off a big upset by ousting second seeds and strong contenders Liezel Huber and Lisa Raymonds from the Family Circle Cup with a straight-set win. The unseeded but in-form Indo-Russian pair shocked the local favourites 6-3 6-4 in the first round of the USD 721,000 WTA hard court tournament. Knight Riders captain Gautam Gambhir. KKR will face CSK in the opening match on Friday. As the cash-rich Twenty20 cricketing extravaganza gets underway at the MA Chidambaram Stadium, it will be the beginning of new era sans Lalit Modi, who was the face of the event during the first two editions. Also, this will be the first time that the league will feature 10 teams with the inclusion of Pune Warriors and Kochi Tuskers Kerala. It will be there for all to see how the BCCI organises an event where Modi used to have a final say in every aspect. The former IPL commissioner and vice-president of BCCI has since then been suspended and now has taken refuge in London after the cricket board pressed numerous charges of corruption against him. After a hugely successful Players' Auction which saw some of the young Indian players commanding astronomical prices, the Chirayu Amin-led IPL governing council will now look to capitalise on India's World Cup triumph which has definitely upped the stakes by manifold. Coming back to the tournament, defending champions CSK will certainly start as the overwhelming favourites against a team that hasn't been able to cash in on its enormous fan following across India, thanks to its principal owner Shah Rukh Khan. After having failed to make it to the semi-finals during the last three editions, the KKR management led SRK and co-owner Jay Mehta have gone for a revamped side with Gautam Gambhir at the helm and T20 specialist Yusuf Pathan as one of the marquee players. With Kolkata's favourite son Sourav Ganguly no longer a part of the team, it will be a big challenge for Gambhir and his boys to start winning and get the cricket crazy Kolkatans rooting for them. The bigger challenge will be to get past CSK who have inarguably been the most consistent team during the last three editions with one championship, one runners-up and a last four finish. Virender Sehwag said his kind of explosive batting was very difficult to emulate and he would not be able to explain his batting techniques to anyone. “My batting is very difficult. I cannot coach”, he said at a media interaction, organised by the Delhi Daredevils team. He said as captain of Delhi Daredevils in the IPL, he was looking forward to the exciting competition “which will provide a great opportunity and platform for the youngsters to perform”. He said he was not bothered about the hectic schedule ahead, as the fatigue factor did not affect him, though a week after the World Cup, the IPL action will start, followed by the Indian team’s tours of the West Indies and England. “I don’t think that the IPL schedule is hectic. I love playing in the IPL,” Sehwag captain said, after taking a vow … “Dil Se Khelenge Dilli Ke Liye”. He said the World Cup victory was slowly sinking in “and we are still celebrating”. He said the celebrations will continue till the conclusion of the IPL and beyond. Despite little contribution with the bat in the World Cup final, the Delhi dasher said the bottom line was “we won the World Cup, and individuals do not matter. It was a collective effort”. Sehwag also echoed the views of Sachin Tendulkar and many others that “Dhoni is the best captain I have played under”. 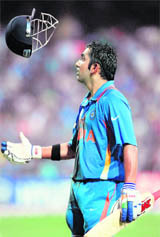 “He executes whatever plans he chalks out, though India have to achieve much more under his captaincy,” Sehwag added. He said he had very little recollection of India’s World Cup victory under Kapil in 1983 “as I was just four years then and I did not know the import of what it means to win the World Cup. But now I know, and I will preserve the videos to show my grandchildren (to savour our World Cup win)”. But Sehwag differed with Dhoni’s views that the Board of Control for Cricket India (BCCI) has worked out a hectic schedule for the players. The Indian vice-captain said he was also in favour of Sachin Tendulkar getting the Bharat Ratna. “I am a fan of Sachin. I want him to win the Bharat Ratna, though I don’t know the rules and regulations are (governing the conferring of such an award)”. Sehwag said he and the other players will give their 100 per cent for Delhi Daredevils to win the IPL and the loss of Gautam Gambhir to Kolkata Knight Riders would not count for much. “We know how Gambhir bats, and we will try and stop him from getting runs,” Sehwag said about his game plan for his Delhi colleague with whom he had forged many enduring partnerships in the first three editions of the IPL. Kings XI have a largely Australian set-up with captain Adam Gilchrist and coach Michael Bevan at the helm and that will help Rimmo settle in the team. “Yes, that will be an advantage. To have people like Gilly and Bevo around,” says the player. Rimmington has been a consistent performer in the domestic circuit in Australia and has featured in 22 T20 games in which he has claimed 31 wickets. His best figures were 5-27 and that included a hat-trick. “I have been practising a lot of slower balls here as these will come in handy on the slower surfaces. And I’d love to play in front of the huge crowds here. That will be some experience,” says Rimmington. Rimmington has had some injury worries earlier, suffering a severe hip injury about two years ago, which needed surgery. But he is fine now. “I was on out for almost 10 months. After that, getting back into action was tough. But I really put in a lot of hard work. I realised that the more I bowled, the better I felt. So, I practised even harder. Today, I feel really lucky to be selected by the Kings XI and I am enjoying practicing here,” he says. “I will be playing against players who have just been crowned world champions. So that will be a challenge. It will be great to bowl to Sachin Tendulkar. Hopefully, I can get his wicket,” says Rimmington. Yuvraj Singh will lead Pune Warriors. "I am looking forward to having an exciting time playing in the IPL. Responsibilities are more, no doubt," Yuvraj said after paying obeisance at the place of his spiritual Guru Baba Ajit Singh in Punjab's Fatehgarh Sahib. "Puree jaan laga key khelengey (We will give our best)," the 29-year-old added. Yuvraj had skippered Kings XI Punjab in the first two editions and played under Sri Lanka's Kumar Sangakkara in the previous edition. Now that both Yuvraj and Sangakkara are no more part of the Punjab side, he was asked to rate the Punjab side. Yuvraj said it was still a good side with players such as Adam Gilchrist, David Hussey, Praveen Kumar and Piyush Chawla in the squad. With a revamped side that sees Adam Gilchrist at the helm of affairs as captain and fellow-Australian Michael Bevan as coach, Kings XI today launched their new season at the Punjab Cricket Association (PCA) Stadium in Mohali. Chief Operating Office, Col Arvinder Singh, was present at the conference, alongside his captain Gilchrist and coach Bevan. Talking about his plans for the upcoming season, Bevan said, “We have put together a strong team this season with some of the best cricketers in the world. At the helm we have the experienced captain Adam Gilchrist who would infuse the right fervour and guide the team to play some great cricket in the upcoming season. “I can just say that my boys are enthused to put the right foot forward and play some great cricket,” he added. Gilchrist, who had steered his previous team Deccan Chargers to a league win in South Africa, also said the new team would look at playing as a unit. “Kings XI Punjab have a new look but we will endeavour to play as one team where each player complements the other. The squad has great talent and with new renewed energy and teamwork we are determined to aim for a successful season. As always, we cherish the unrelenting support and love of all our fans and assure them of our best efforts on the field,” said Gilchrist. The franchise have also signed South African batsman David Miller in place of the injured Dimitri Mascarenhas. Rooney had come under fire — and earned a two-match ban, along with front-page headlines — for a foul-mouthed tirade at television cameras after scoring his hat-trick in a 4-2 win over West Ham last week. After firing home decisively at Stamford Bridge yesterday, the England forward resisted any temptation to scream out his feelings as he raced towards the cameras behind the goal after sweeping home Ryan Gigg's low cross in the 24th minute. Manager Sir Alex Ferguson and defender Rio Ferdinand saluted Rooney, the England defender telling ITV sport, "He's a top quality player - he showed flashes of brilliance." For Ferguson, Rooney "was important on the counter-attack and he was in tremendous form and he has given us a great chance of reaching the semi." He added, "It's still in the balance (but) it's good result for us. That away goal does mean something." Tuesday's fireworks comprising Real Madrid's four-goal salvo against the other English survivors, Tottenham, and Schalke's 5-2 demolition of holders Inter Milan in the San Siro had set the entertainment bar sky-high. Although the goal count in London was lower, the full-blooded nature of the encounter kept the fans on the edge of their seats as both sides set about their business with gusto. United, who saw off Chelsea in a penalty shootout in the 2008 final, gambled on the fitness of England veteran Ferdinand following more than two months struggling with a calf injury and his experience was a boon in a tense affair. Rooney's strike gave United their first win at Chelsea in nearly a decade and the three-time European champions are now clear favourites to advance to a likely semi-final against Schalke. The controversial Australian's tumultuous tenure ended after the India's first-round exit from the 2007 World Cup in the West Indies. "I really don't know what went wrong with Greg. But I am sure the kind of hard work that Greg put in during his times like shuffling the team and giving the younger players a chance is playing a part in India's success now," Bayliss said. "Kirsten has been a great player of his time, knowledgeable and is well respected. To be a good coach, you first have to get the respect of the players and Gary achieved that over his time. And the results have helped him too," Bayliss, a former first-class cricketer, said. The task of appointing the new person to take over the reins of the team is expected to be finished in a couple of months, CSA said in a media release. The panel, appointed to make its recommendation to the Board, had held its first meeting on Tuesday to review the list of applicants and plan the way forward. "We are not able to announce the names of the candidates shortlisted because of confidentiality issues as some of the candidates are currently still under contract," said CSA CEO Gerald Majola. "What is highly gratifying is the quality of the applications received from leading coaches both from around the world and from our domestic structures," he said. The Sania-Elena pair saved eight break chances, including five in the second set, when the Americans upped the intensity in a bid to stay in the match. In the quarter-finals, they will take on the Russian-Australian combination of Alla Kudryavtseva and Anastasia Rodionova.